Xi Jinping has been China's president for less than a year but he is already attempting to consolidate his power under the guise of a clampdown on corruption. The ongoing purge has already seen top party chief Bo Xilai ousted and sentenced to life imprisonment for taking millions of pounds of bribes, embezzling public money and trying to cover up the murder of the British businessman Neil Heywood [Telegraph]. But while Bo Xilai drew strong interest and headlines in both domestic and the international press, others have slipped under the radar and glare of the media spotlight. In late 2012 Li Chuncheng, a deputy party chief of Sichuan, was investigated for corruption [BBC]. Within a year he had joined the growing list year of others ousted from the party. Amongst them were Wang Suyi, former senior official of north China's Inner Mongolia Autonomous Region, Li Daqiu, former vice chairman of the Guangxi Committee of the Chinese People's Political Consultative Conference (CPPCC) and former chairman of the Guangxi Federation of Trade Unions, and Jiang Jiemin, head of the State-owned Assets Supervision and Administration Commission [BBC / China Daily / Telegraph]. Liu Tienan, former deputy director of the National Development and Reform Commission, and Wang Yongchun, the deputy general manager of the China National Petroleum Corporation also found themselves investigated and ousted from their positions [BBC / WSJ / Caixin]. These individuals escaped lightly in that they were merely expelled from the party. Other were less fortunate such as Former railways minister Liu Zhijun who in July was given a suspended death penalty for taking bribery and abuse of power [Xinhua]. The ongoing purge is now focussing on Zhou Yongkang and his allies in what appears to be a concerted campaign to rid the party of any individuals that might oppose Xi Jinping [SCMP / NYT / NYT / CDT]. Rumours had circulated as early as March 2012 that Bo Xilai and communist party official and domestic security chief Zhou Yongkang had been plotting for a political takeover within the upper ranks of the Communist Party [tvnewswatch: Suspicious death of Briton with links to Bo Xilai / tvnewswatch: Rumours of coup..]. Whispers surrounding President Xi Jinping's "tiger hunt", a metaphor for seeking out corrupt senior government officials, have been circulating ever since he assumed the top positions in party and state in 2012. But Zhou's ousting would be relatively unprecedented in recent Chinese history, indeed it would hark back to the days of Mao when even top officials could be purged, jailed or even meet an unsavoury end. Until 2012, Zhou was a member of the Politburo Standing Committee, with oversight for the police, courts and intelligence services. Although Zhou is widely believed to be guilty of corruption and abuse of power, no current or retired member of the Politburo Standing Committee has ever been prosecuted. Last month Li Dongsheng, a deputy national police chief with close ties to Zhou Yongkang, became the latest target in the ever widening anti-corruption probe [SCMP]. While claims that Zhou may have been involved with Bo Xilai in a planned coup might be highly exaggerated, it is clear the noose is tightening. The few details which filter out paint a picture of much infighting within the CCP, though there are no official statements on the matter. There is also concern raised since the ousting of Zhou will result in Xi having more control over both the security services and the military than any Chinese leader in decades. This is particularly concerning given a rise of nationalism across the country, a condition which has been exacerbated by China's slowing economy. In an address made in February last year at the Center for Security Policy's National Security Group Lunch on Capitol Hill, Gordon Chang, author of The Coming Collapse of China, suggested that a slowing and distressed economy, as well as a crisis of political legitimacy would only further nationalism within China which in turn would increase hostility with its neighbours [YouTube]. This something that has already manifested itself in China's establishing of a new "air defence identification zone" which covered much of the east and south China sea [BBC]. Tensions between China and its neighbours have been growing sometime concerning claims by China over disputed territory. However China's aggressive approach is seen by some as being particularly dangerous. The newly declared zones has not been accepted by the international community and herein lies the danger. Soon after China implemented the new zone the US ignored it and flew unarmed B52s through the zone without declaring their presence. The US flights were followed soon after by brazen intrusions by South Korean and Japanese aircraft. Though China did not respond directly they subsequently put military reconnaissance flights into operation within the newly declared zone. China has continually tested the US's resolve over the last decade. It has harassed unarmed US Navy reconnaissance vessels most notably the blocking of the Impeccable in the South China Sea in 2009 [Wikipedia / BBC]. In 2001 China forced down a Navy EP-3 in the infamous Hainan Island incident and in 2006 China surfaced a Song-class attack submarine in the middle of the Kitty Hawk strike group near Okinawa [Washington Times]. So far the United States have resolved such issues diplomatically, but such impotent reactions could be read as signs of weakness by Chinese military strategists. While conflict is best averted, China's arrogance and assertiveness could well lead to a very dangerous year in 2014. Indeed, one day into the new year China implemented new rules on fishing access to disputed areas of the South China Sea which require foreign fishing vessels to ask for permission to enter its waters. The new rules have been described as "provocative and potentially dangerous." by the United States which could itself become embroiled in any future conflict between China and its neighbours [BBC / Reuters]. "The passing of these restrictions on other countries' fishing activities in disputed portions of the South China Sea is a provocative and potentially dangerous act," State Department spokeswoman Jen Psaki told a news briefing. "China has not offered any explanation or basis under international law for these extensive maritime claims." "Our long-standing position has been that all concerned parties should avoid any unilateral action that raises tensions and undermines the prospects for a diplomatic or other peaceful resolution of differences," Psaki added. China however maintains the new rules were legitimate. In a report in the state run China Daily. "The goal is to strengthen the security of fisheries resources and to reasonably utilize and exploit them," ministry spokeswoman Hua Chunying said at a regular news conference and added that the implementation of the rules were "a normal routine practice" for an ocean state. The Global Times, another mouthpiece for the Chinese Communist Party, and Xinhua both quoted Hua saying that "under international laws, universal practice and domestic laws" China had the "right and obligation to manage the biological and non-biological resources on relevant islands, reefs and in relevant waters"
The waters concerned have certainly seen tensions in the past. In March 2013, Hanoi accused China of shooting at a Vietnamese fishing boat in the area and setting fire to its cabin. In May, a Taiwanese fisherman was shot dead by Philippines coastguards in waters claimed by both countries, an issue which Beijing capitalised on given its territorial claims concerning Taiwan. Speaking to BBC's Newshour today [Friday 10th January] Hu Xijin, editor of the Global Times reiterated China's stance concerning its operations in the East and South China Sea. Occasionally described as China's Fox News, the Global Times, with a distribution of some 1.5 million, outputs often aggressive and strident nationalist articles and sharp critiques of the west and US foreign policy in particular. "They can't interfere in our politics and we don't interfere in their politics," Hu insists, when quizzed on China's aggressive stance in the South and East China Seas concerning its neighbours. "Do you see the cannon in the South China Sea? You don't. Do you hear the cannon in the South China Sea? You don't." Hu concedes there is always an ongoing struggle but maintains the situation is not volatile. "Now in the South China Sea there is peace, not war." There may not be a war, but the tensions existing in the South and East China Seas could hardly be described as peaceful. Xi may be attempting to maintain stable relations with the United States and Britain, trying to build business and economic ties. But at the same time Xi is expanding China's military capabilities and asserting its regional interests. With a quickening arms race in Asia, growing nationalist rhetoric, and continued tensions with Japan, Vietnam and the Philippines, there is a risk of misunderstandings and possible mishaps. Xi Jinping's domestic policy is intrinsically tied into its foreign policy. His anti-corruption policy may, on the face of it, seem laudable. However it is likely a whitewash. While many of the ousted officials may indeed be guilty of massive corruption and other crimes, their dismissal from the party is likely to serve Xi's interests by shedding officials which are less willing to back his own agenda. How many of Xi's closest allies are guilty of corruption is difficult to assess. But given that corruption runs so deep within the Chinese power structure it is hard to believe his own supporters are not taking bribes or involved in illegal activities. 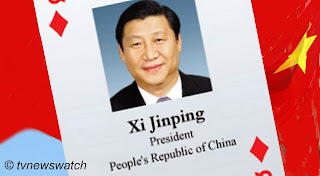 Indeed according to public documents compiled by Bloomberg, Xi's own extended family have over many years expanded their business interests to include minerals, real estate and mobile-phone equipment. The documents do not implicate Xi himself, his wife or daughter, but the massive holdings of his extended family are not comfortable reading for a man claiming to be on an anti-corruption drive. Xi was said to be "repulsed by the all-encompassing commercialization of Chinese society, with its attendant nouveau riche, official corruption, loss of values, dignity, and self-respect," according to a leaked US cable disclosed by Wikileaks. However Beijing's attempt to cover up foreign investigations which reveal the wealth of its top leaders, through media blackouts and censorship, only increases suspicions that corruption goes right to the top. Thus the ongoing campaign to rein in corrupt officials is clearly a smokescreen to cover-up the central committee's wrong-doing and to rally support for the CCP as a whole. Indeed this and the nationalist campaigns are all designed to avert eyes from the very real economic problems China faces in the coming years.